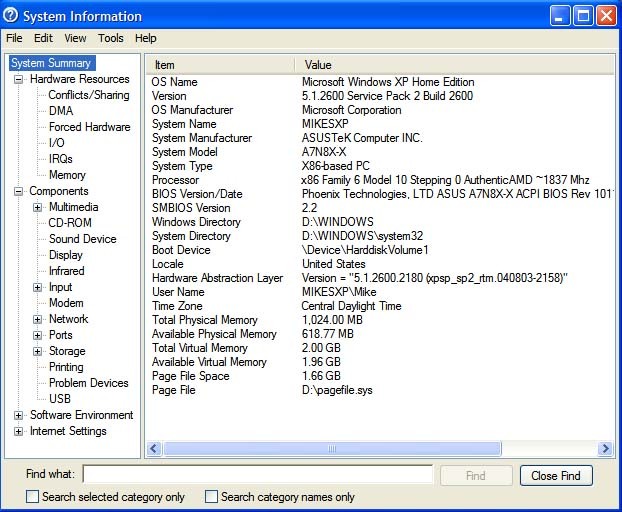 If you go to Start-Accessories-System Tools-System Information, you will get the screen shot below. There is a whole lot of important information about your System in this utility. You can check your DirectX by going to Tools-DirectX Diagnostic Tool, this will inform you as to the version of DirectX your System is running as well as any errors or problems. You can also check your Sound and Graphic's with this tool. On the left hand panel you can expand the + symbols and check such things as your IRQ's, Conflicts and sharing, Forced Hardware. Under the Components, you can click on the Sound Device to see what Sound Card your System has, CD-ROM, Display, Network, Modem, it lists all the Hardware in your System. Under the Software you can check the Services, Running Tasks, Startup Programs and more. As it says it gives you all the System Information for your Computer.